The Booker T story is one of redemption, and of not accepting the path you may currently be on, rather than the one you desire to be on. Booker Tio Huffman was born in 1965 Houston, TX, and left an orphan by the time he was fourteen, with his older brother Lash “Stevie Ray” Huffman stepping in to raise him and his other siblings. As a young man, Booker plead guilty to armed robbery, seeing him sentenced with five years in prison. He was released after serving about one third of the term, and decided to change the direction of his life. He entered wrestling school and soon began working as GI Bro, and soon with his brother Stevie Ray as the Ebony Experience in the Global Wrestling Federation. In 1993 Booker T and Stevie Ray debuted with World Championship Wrestling as Harlem Heat. They went on to be multiple-time WCW Tag Team Champions, facing off against teams such as The Nasty Boys, The American Males, Lex Luger and Sting, Rick and Scott Steiner, Public Enemy, and Kevin Nash and Scott Hall. In 1997 Booker transitioned into singles competition, soon winning the WCW World Television Championship, the first African American to ever do so, and would defend it against the likes of Perry Saturn, Rick Martel, Bret Hart and Scott Steiner. In 1999 Booker T and Stevie Ray briefly reformed Harlem Heat, and then Booker also briefly resumed his GI Bro character. In 2000, Booker made it into the main event picture when he defeated Jeff Jarrett to win the vacant WCW World Title. He was soon bested by Kevin Nash, then won it back a couple weeks later. He then lost it again in a wacky way to Vince Russo, but then won it for a third time again from Jarrett. He later lost the title to Scott Steiner and was out with an injury for a bit. Upon returning he defeated Rick Steiner for the WCW United States Championship, making him the company’s eighth Triple Crown winner. He won the world title for the fifth time from Scott Steiner on the final episode of Nitro. Booker T was the most-decorated athlete in the history of WCW, winning 21 titles. When WCW invaded World Wrestling Entertainment in 2001 after WWE purchased the company, Booker was at the forefront of the program. He had notable rivalries with Kurt Angle, The Rock, Stone Cold Steve Austin, and Edge. In 2002 he had a great team with Goldust, who had notable feuds with Christian and Lance Storm, Christian and Chris Jericho, and the Dudley Boyz before going their own ways. On his own, he had a hot feud with Triple H, seeing the two face off at WrestleMania 19. He then chased the Intercontinental Championship, competing against Christian, and later against Mark Henry. In 2004 he teamed with Rob Van Dam to defeat Ric Flair and Batista for the Tag Titles, then soon turning heel against RVD. He soon targeted The Undertaker, John Cena, and then turning face again to defeat John Bradshaw Layfield. In 2006, Booker won the King of the Ring tournament, becoming King Booker, leading a faction that included William Regal and Fit Finlay. King Booker feuded against Bobby Lashley and then defeated Rey Mysterio for the World Heavyweight Championship. He defended the title against Batista for several months with Batista ultimately winning. He had short feuds with Kane, Triple H, and Jerry Lawler before leaving the company in 2007. For the next two years Booker T competed in Total Nonstop Action, having runs against Kurt Angle, Kevin Nash, Bobby Roode, Rhino, Samoa Joe, AJ Styles, and James Storm. In 2011 he returned to WWE at the Royal Rumble. He faced off against Cody Rhodes in a feud before transitioning into an on-screen but not really in-ring performer, first as General Manager of SmackDown and now as a commentator on Raw. Booker was inducted into the WWE Hall of Fame in 2012. He tells the story of when he was leaving prison one of the guards jokingly said, “See you again.” Booker T takes pride that yes, the guard did see him again. But not back in the walls of the prison, and instead every week on TV with thousands in attendance and millions worldwide cheering him on in his hall of fame career. 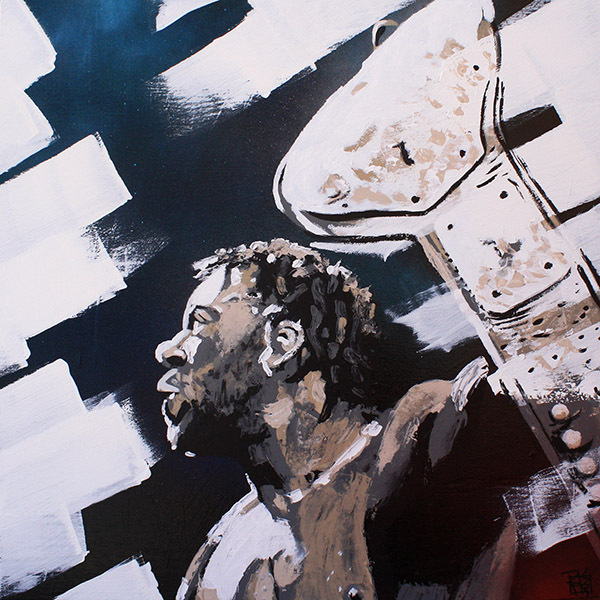 About the piece: I didn’t realize it at the time, but I feel like the diagonal white bars, broken by Booker thrusting the World Title through them, symbolizes his life story of using wrestling to break out of a path that had landed him in prison.